How does Jam mode work? 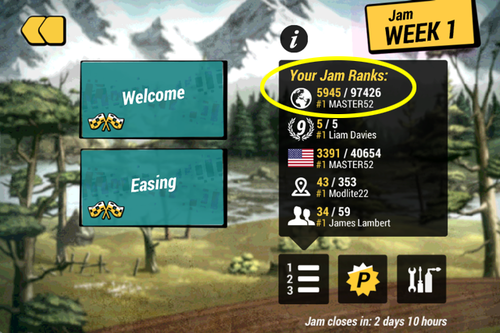 Jam is a fun, weekly competition where all participants focus on racing one or two tracks, and their times from those tracks are combined to give them an overall placement. Each Jam round begins on a Wednesday or Thursday (depending on where you live in the world) and lasts for seven days. If you’re in the top 10 percent in overall time, you’ll be placed into Division 1 and you’ll earn the virtual Red Bull helmet, which can’t be purchased. And so on, down to the final division, 10. From your starting division, if you have a good next week, you can move up one division at the completion of the round. If you stay steady, you’ll maintain your division. If you have a bad week or you don’t play, you’ll fall a division. There’s never more than one division of movement from round to round. On the individual track pages, you’ll see where you rank on your five leaderboards: global, divisional, national, regional (in some countries), and social. Tap the first button under those ranks to access the leaderboards. Anyone can view the Jam leaderboards for free, but to watch times on it or attack specific times, you’ll need to buy some Premium Jam rounds (get them from the middle button with the P on it). 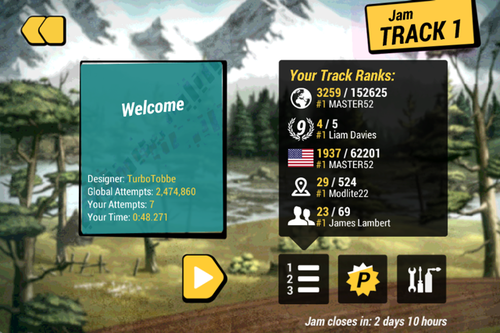 In Career/Time Attack mode, watching and attacking leaderboard times is free. If you tap the yellow arrow, you’ll automatically be paired up against a real player who’s time is slightly better than your best time. With each win, the play arrow will pit you against another slightly faster foe. It’s a great way to slowly but surely climb the leaderboards and improve your time and your overall skills. Oh, and there are no rockets in Jam. Pure racing only. How do I stop the game from lagging? How do I unlock the Pro Career levels? What does it mean to Ace a track? What is an Ace? What do the different leaderboards mean? What do the stars mean on Versus tracks? What is up with the two different numbers on a player’s Versus level indicator? Why aren't rockets working or showing up for me? Why does bike 11 start with the fork compressed? Why does the throttle cut out sometimes?